"An all star crew, headed by Cliff. We were lucky to be surrounded by a team of Crew Leaders -- Jamie, Jake, and Greg! Experience, knowledge, and camaraderie was prevalent throughout the trip. 'Sandra' was the best! Greg is a great orator. Jake and Jamie kept the mood light and Cliff got us home. Best in all you do. A memorable life experience. Great guitar in the canyons!" -- Dave D.
Trip Leader Cliff Ghiglieri approaches the landing at Diamond Creek at trip's end. 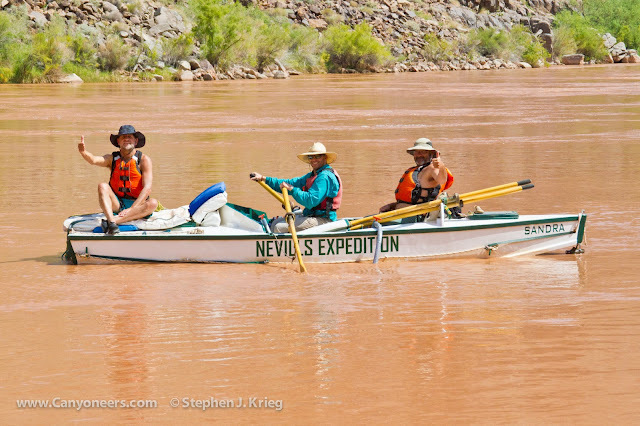 "A most excellent river trip. I had a wonderful time. The guides were great. I will not forget riding the Sandra and doing the 'fish eye'. Cowabunga! Greg was fabulous. Folk lore, the Nevills, very fun. Thank you kindly from an experienced traveler and camper." 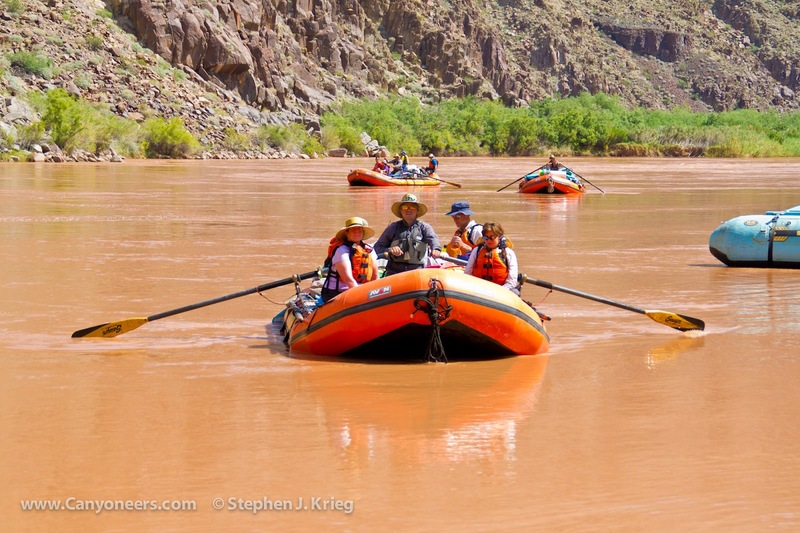 -- Robert R.
"When we decided to book a trip in the Canyon, we knew we wanted an oar trip. We had a few companies to choose from. When I read about the Sandra I immediately booked that trip. 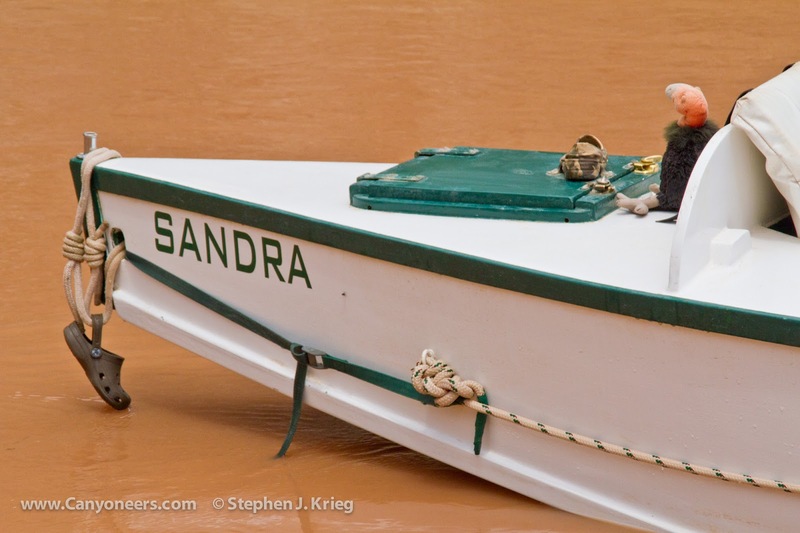 My experience on the Sandra was really special. Hearing the story about it was heart felt. 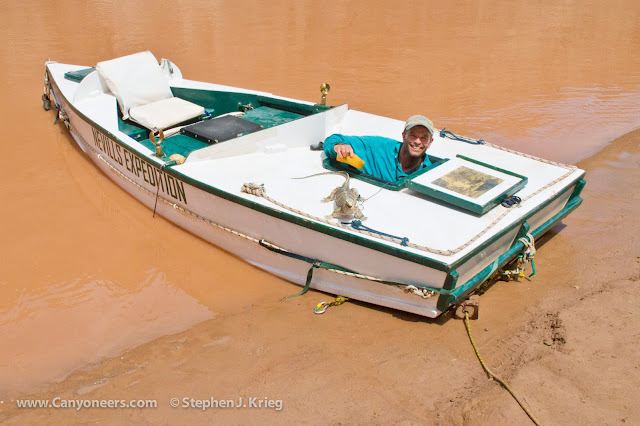 That little wooden boat is really admired by other river companies. I noticed it when they were scouting rapids. They would say, 'That is really cool, are you going to run that through the rapids?' 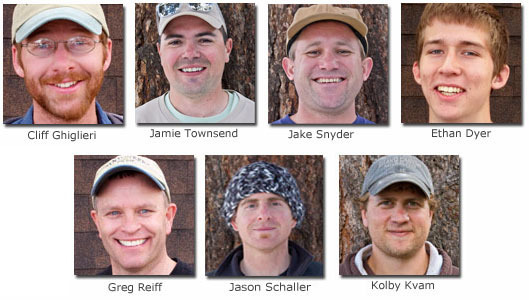 All your employees -- Ethan, Jason, Greg, Cliff, Jake, and Jamie -- made us feel safe and like family." 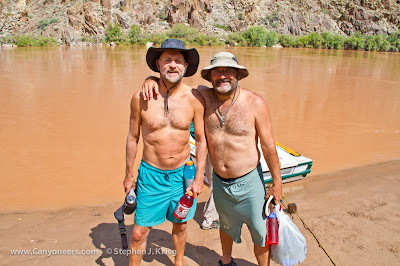 -- Joe R.
"A wonderful, beautiful adventure with great guides. I loved hearing about geology and history of the Canyon as well as the story of the Sandra, which was a treat. All guides were helpful and accommodating, and especially appreciated Cliff's guitar and guidance. Jake's guitar, singing, and passion for the river. Greg's stories and helpfulness, Jamie's humor and calm, and Ethan and Jason's help always making camp as comfortable as possible. The food was great! I will remember canyon walls, the stars, waterfalls and, yes, the rain." -- Joan D.
"Thank you so much for everything! I wish it wasn't ending tomorrow. I will miss you all. I didn't know what to expect, I wasn't expecting much. But by the last night here I feel so sad because I don't want it to be over yet. Jamie took us on a side hike to show us pictographs and talk about Indian tribes today, that was very interesting to learn about. Jake was so down to Earth and fun to ride with. Greg had an amazing boat called the Sandra, and it was such an experience to ride. Jason and Ethan were such sweet boys. Cliff, I really enjoyed all your information about the Grand Canyon. I really enjoyed talking about music and such with you. You are truly one of a kind and will be missed." -- Heather R.
Greg Reiff oars the Sandra to the beach at Diamond Creek, with Peter and Daiton celebrating their last few moments aboard. "I came here to ride the Sandra, and ride I did. It was one of the most wildest things I have ever done. Thanks, Greg, for all the wonderful things you did to keep our spirits up, and all the information about the Canyon you gave us. Keep the Sandra alive!! Thanks to Cliff and crew and all you did." -- Daiton R.
at the Diamond Creek take-out point. "Lost my camera on day one. Broke my reading glasses on day two, and probably broke a bone in my foot on day three. Yet this place is magical and mystical. 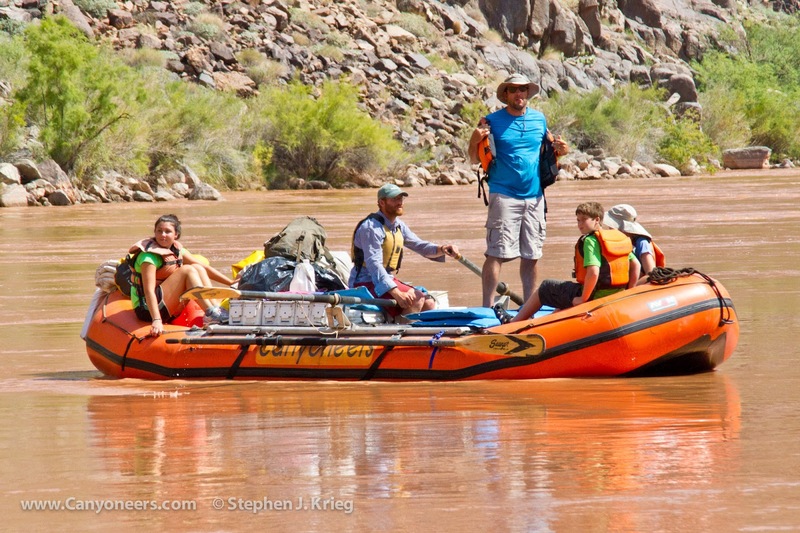 The power of the river and beauty of the canyons cannot be underestimated. To travel through this environment on a piece of Canyon history (a.k.a. the Sandra) was an experience I will not forget." -- Peter E.
"Thanks for it all! Joan said it well last night: your passion for the Grand is evident and was throughout the trip. Among my highest highlights was my day on the Sandra. Jaynie was disappointed that I deferred riding Lava [Falls Rapid], but we had more than a few good rides during our turn. I will always remember this trip and each of you. See you down the road, or the river, as it may be. Thanks again for everything! My best to each of you." -- Walt D.
"To the men-in-flip-flops: What a great trip! I didn't know what to expect, and am still amazed at all we did. 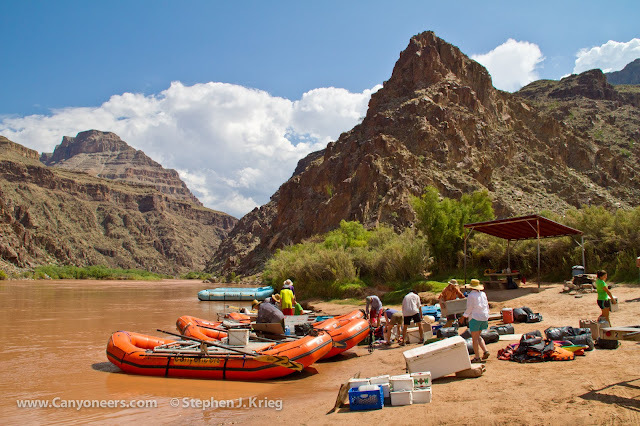 Not only was it a great ride down a spectacular river, it was a truly special experience each day, thanks to your stories both personal and historic, your knowledge of the geology and science, and your obvious love for this wonderful place. I hope we meet again -- I wouldn't choose any other outfit but the Men In Flip Flops / Canyoneers!" -- Jaynie D.